The following tutorial demonstrates how to find a Node using methods of RadTreeView and RadTreeView.Nodes objects. The example first locates a root level Node by text, then searches its child Nodes for a specific attribute. In a new AJAX-Enabled Web Application, drop a standard ASP.NET Button, a RadTextBox and a RadTreeView to the default form. In the Properties Window set the Skin property of the RadTreeView to Vista. In the Properties Window set the ID property of the button to "btnFind". In the Properties Window set the ID property of the RadTextBox to "tbResults" and the Skin property to Vista. Double-click the button to create a Click event handler. In the code view for the form, add Telerik.Web.UI to the "uses" (C#) or "Imports" (VB) section. Add an array and two enumerations to the page class. These will be used to populate our RadTreeView. Populate the Page_Load event handler with the code shown below. This code has nested iterations of the Products string array, the Sizes enumeration and the Colors enumeration. For every new product name a root level Node is created. For every size and color for that product a child Node is created. Custom attributes "Size" and "Color" are attached to the child Node. Add the code below to the button's Click event handler. The first Node search is against all the Nodes in the tree for the text "Alpine Parka". 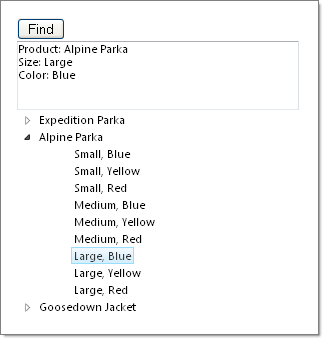 If the Node is found, a second search is done against the Nodes collection of the "Alpine Parka" Node. This second search is looking for a Node with an attribute called "Size" where the value for the Size attribute is "Large". If this child Node is found then the product name is added to the RadTextBox, the product Node is expanded to display the child Nodes and the specific Node we are looking for is selected. The attributes for the Node are iterated and the contents are appended to the RadTextBox.